Christopher Harper-Mercer, the gunman who attacked Umpqua Community College on Thursday, had long struggled with mental illness and was described as a "hate-filled" individual with anti-government, anti-religious and white supremacist leanings, law enforcement officials said. Harper-Mercer was a student in the English class where he opened fire. Fourteen firearms were found at the college and at Harper-Mercer's apartment, officials said Saturday after finding another weapon at his residence. The nine people killed by the gunman ranged from 18 to 67 years old. Nine others were injured. Read what we know so far about Harper-Mercer, who was from Torrance. We've been following developments today on who exactly the shooter, Chris Harper-Mercer, was and what might have led him to gun down his classmates. Some things we reported today, in addition to the above: He grew up in Southern California, but had recently moved to Oregon. He struggled with mental health issues, officials said, and neighbors recall seeing him throw tantrums at his apartment complex in Torrance. In Torrance, he attended a special needs school and community college before moving with his mother to Oregon. And in 2008, he joined the Army but was discharged a month later. An online dating profile described Harper-Mercer as "conservative" and "Not religious...but Spiritual." Web postings using an email address associated with Harper-Mercer mentioned the 2012 Sandy Hook Elementary School massacre and commented on Vester Flanagan, the disgruntled ex-employee who shot a Virginia television news reporter and cameraman at his former station on-air. When a gunman opened fire in a classroom next to his, Chris Mintz rushed toward the sound of the bullets popping, according to an account he gave Jayme Skinner, the mother of his son. Mintz approached the gunman and pleaded with him. "It's my son's birthday!" Mintz told the shooter as he collapsed to the ground, Skinner said. Bullets hit Mintz in the upper back, hip, abdomen and left hand, Skinner said, but he is in stable condition at the hospital. Their son, Tyrik, turned 6 on Thursday. He has autism, Skinner said, and doesn't understand what happened. "It's a blessing," Skinner said, tears welling in her eyes. She said she wasn't at all surprised by Mintz's instinct to jump in and try to protect others -- he served time in Iraq, she said, as an Army infantry soldier. "I would've been shocked if he didn't," she said. Skinner said Mintz -- who's also a body builder -- is originally from North Carolina, but came to Oregon with her. He chose Umpqua, she said, because he wants to be a personal trainer and the school has a good program. Sarena Dawn Moore, 44, of Myrtle Creek, Ore., was a Seventh-day Adventist who worked for the church, according to a report in the Oregonian . Moore attended high school in Reno and seemed to have a passion for animals, the newspaper reported. Her brother, Rick Goin, spoke briefly with the paper on Friday afternoon, and thanked law enforcement for stopping the gunman. "One thing I will say is I'm glad the officers, when they did get there, took care of business," he said. "The shooter is gone and we don't have to wait for trials and everything else." Jason Johnson was a resident of Winston, Ore., according to sheriff's officials. Monday was Johnson's first day at Umpqua Community College. He had struggled with drug abuse and recently completed a six-month rehab program, his mother, Tonja Johnson Engel, told NBC News . "He started Monday and he was so proud of what he had accomplished, and rightly so," Johnson Engel told the network. "The other day he looked at me and hugged me and said, 'Mom, how long have you been waiting for one of your kids to go to college?' And I said, 'Oh, about 20 years.'" Rebecka Ann Carnes, the daughter of a local paramedic, was a new student at the college, according to her family. "This isn't how life is supposed to work and I am struggling to wrap my mind around the entire situation," her cousin, Lisa Crawford, wrote on Facebook . Lucero Alcaraz was a student and aspiring pediatric nurse, according to her family. "She was my best friend and my sister," wrote Maria Leticia Alcaraz in a Facebook post Friday . "You would have been a great pediatric nurse," she wrote in another. "I was so proud of you." Her younger sister, Eileen Alcaraz, told Buzzfeed that Lucero loved to draw and that she was the "responsible one" of the family's six siblings. On Thursday, Lucero's cousin and other friends frantically posted her photo on social media , asking anyone who had seen her to come forward. Larry Levine, 67, was an assistant English professor at the college, according to the school's website. Quinn Cooper was attending his fourth day of college classes when he was killed in the attack at Umpqua Community College on Thursday, his family said. The 18-year-old had a variety of interests, and he enjoyed both martial arts training and dancing, his family said in a statement. "Our lives are shattered beyond repair ... No one should ever have to feel the pain we are feeling," the statement read. Cooper was also a recent graduate of Roseburg High School, his family said. His mother posted several photos to Twitter on Friday showing the young man smiling while sporting a cap and gown or wearing boxing gloves as he leaned against a punching bag. Lucas Eibel, 18, was a recent graduate of Roseburg High School who enjoyed volunteering at a local animal shelter and playing soccer, his family said in a statement released Friday. Eibel was a recipient of the Scholars Award at Umpqua Community College, where he studied chemistry. Treven Anspach was a second-year student at Umpqua Community College who aspired to become a paramedic, his brother said. Anspach's older brother, Cameron, described him as a "real cool dude to hang out with, always brings a good time, a smile to your face." The 20-year-old was a graduate of Sutherlin High School, where he played basketball, according to his public Facebook page . Anspach's father was a local firefighter, according to the Douglas County Sheriff's Office. "My dad’s a firefighter paramedic, so he was kind of pursuing in his footsteps," Cameron Anspach told The Times on Thursday. The Douglas County Sheriff's Office identified the nine people who were shot and killed in the attack at Umpqua Community College on Thursday morning. -- Lucero Alcaraz, 19, Roseburg, Ore.
-- Jason Johnson, 33, Winston, Ore.
-- Lawrence Levine, 67, Glide, Ore.
-- Sarena Dawn Moore, 44, Myrtle Creek, Ore.
-- Treven Taylor Anspach, 20, Sutherlin, Ore.
Douglas County Sheriff John Hanlin also revised the number of those who were killed and injured in Thursday's shootings. Ten people, including the gunman, were killed and nine were injured, Hanlin said Friday. Harper-Mercer had struggled with mental health issues since he was a teenager, a law enforcement source said. Other details about him are beginning to emerge as investigators try and figure out the motive for the rampage. One law enforcement source described the 26-year-old as a "hate-filled" man. The Army record of the shooter and one of his victims couldn't be more different. Gunman Chris Harper-Mercer, who killed nine people at Umpqua Community College, served in the Army for about one month in 2008, from Nov. 5 through Dec. 11. He was discharged for failing to meet the minimum administrative standards to serve, Army records stated. Christopher Lee Mintz, is a student and Army veteran. Mintz's family told WFMY News 2 that when shooting erupted he told his classmates to remain calm, confronted Mercer---and was shot multiple times. During his military service, Mintz earned three awards, Army records show: National Defense Service Medal, Global War on Terrorism Service Medal and Army Service Ribbon. He is hospitalized, but smiling from his bed. President Obama reiterated his call Friday for congressional lawmakers to act to stem gun violence, vowing to campaign for changes and to further politicize the issue. Speaking in the wake of Thursday's mass shooting at a community college in Oregon, Obama said gun violence won't end "until the politics changes and the behavior of elected officials changes." He promised to keep talking about the issue and pointed out that Congress' failure to strengthen background checks after the Newtown shooting in 2012 was because of political differences. "We've gotta change the politics of this," Obama said at a news conference at the White House. Obama said he has asked his administration for more steps it can take to stop gun violence but that he wants to go further. Ten people were shot to death Thursday at Umpqua Community College, including the gunman, identified by law enforcement officials as Chris Harper Mercer. He was described as a "hate-filled" individual with anti-government, anti-religious and white-supremacy leanings. Hours after the massacre, a visibly frustrated Obama said he has grown tired of what has become the "routine" nature of mass shootings in the U.S., and he demanded a change in the politics of guns in America, saying that simply thinking of and praying for victims was "not enough." Top Oregon officials thanked the first responders to the shooting and called for a halt to the number of mass shootings in the U.S.
Gov. Kate Brown, U.S. Sens. Ron Wyden and Jeff Merkley, and Rep. Peter DeFazio praised the town of Roseburg for coming together to help the victims of Thursday's shooting. "All of Oregon stands with Umpqua Community College and Roseburg," Brown said, adding that mass shootings are "going to keep happening until we decide it will stop." "This is a conversation we will have," she said of gun-control laws. "But today is not the day." Obama is expected to announced Secretary of Education Arne Duncan's departure, and is also expected to make more comments about the shooting. An Oregon winery has identified one of the victims of Thursday's shooting as Kim Dietz. In a public Facebook post , the staff of Pyrenees Vineyard in Myrtle Creek, Ore., said Dietz, the vineyard's longtime caretaker, was among those shot and killed at Umpqua Community College. Dietz's daughter was also a student at the college, but was not hurt in Thursday's attack, the post said. Her husband, Eric, manages the vineyard, which is 20 miles south of Umpqua's Roseburg campus. "We appreciate your respecting the Dietz family's privacy in this time of immense sorrow," the post read. "In these times we must come together, lean on family, and never forget God's love." Law enforcement officials have yet to formally identify any of the victims of Thursday's attack. Law enforcement officials said 13 weapons were recovered from Umpqua Community College and the gunman's residence. Six were found at the school. Seven were taken from the apartment of Chris Harper Mercer, 26. All were purchased legally, officials said. Mercer opened fire at the college Thursday morning, killing nine people. He was then killed in a gunfight with sheriff's deputies. Investigators believe that Chris Harper Mercer, the gunman in the Oregon college shooting, was a hate-filled individual with anti-government and conspiracy tendencies, a law enforcement source with knowledge of the probe said Friday. Mercer's communications and activities suggest he was supportive of the white supremacist agenda and opposed organized religion, said the source, who did not want to be named because of the ongoing investigation. The 26-year-old gunman, who was killed in an exchange of gunfire with law enforcement officers, also liked to discuss military history, the source said. Authorities have obtained some of his writings and a note he left behind. Chris Harper Mercer was obsessed with guns and religion and had some leanings toward white supremacy, according to a federal law enforcement source familiar with the investigation. During the Thursday rampage, Mercer, 26, wore body armor and had extra ammunition, although it is unclear whether he carried the ammunition during the shooting or left it in his car, the source said Friday. A number of weapons have been found during an overnight search of the apartment that was home to the gunman who attacked an Oregon community college, killing at least nine, officials said Friday morning. Investigators are trying to sort out a motive in the Thursday attack at Umpqua Community College that also left 10 wounded. The gunman, identified by law enforcement as Chris Harper Mercer, 26, died in a gunfight with officers. The investigation into the shooting is continuing, Douglas County Sheriff John Hanlin told television stations in Eugene, Ore. early Friday. Further details are expected to be released at news conferences later in the day. At a Friday morning news conference, Dr. Jason Gray, chief medical officer of Mercy Medical Center, said the average age of the Umpqua Community College shooting victims skewed young. Some of the victims' injuries, he said, included gunshot wounds to the abdomen and head. "The initial emotions are disbelief," Gray said, wincing. "It's still very raw." But he'd found some comfort, he said, in the outpouring of support from across the country. Retired physicians came in Thursday to offer help, he said, and people in Louisiana and Georgia had pizzas delivered to the hospital staff. Someone else sent coffee. Mercy Medical Center Chief Executive Kelly Morgan said many people on the hospital's staff trained at UCC and that he expected many employees knew victims. "I assure you," he said, "every single person at the hospital will be impacted." Dr. Jason Gray, chief medical officer of Mercy Medical Center in Roseburg has updated the status of 10 patients who were admitted to the hospital after the Umpqua Community College shooting. -- 2 were treated and released Thursday. One person currently hospitalized is expected to be released today. Ana Boylan, 18, was in her classroom at Umpqua Community College when the gunman entered and shot her professor, she told family members Thursday afternoon. Boylan, who had started attending the college this week, was shot in the back, said her grandmother, Janet Willis. A girl standing next to her was shot, too, Willis said. "They just laid on the ground and pretended they were dead," Willis said her granddaughter told her and other family members. Boylan tearfully recounted her ordeal from a hospital bed after she'd been airlifted to a Eugene hospital. As she lay wounded in the classroom, she told her grandmother, she heard the gunman ask others to rise and state their religion. "If they said they were Christians, they were shot again," Willis said. 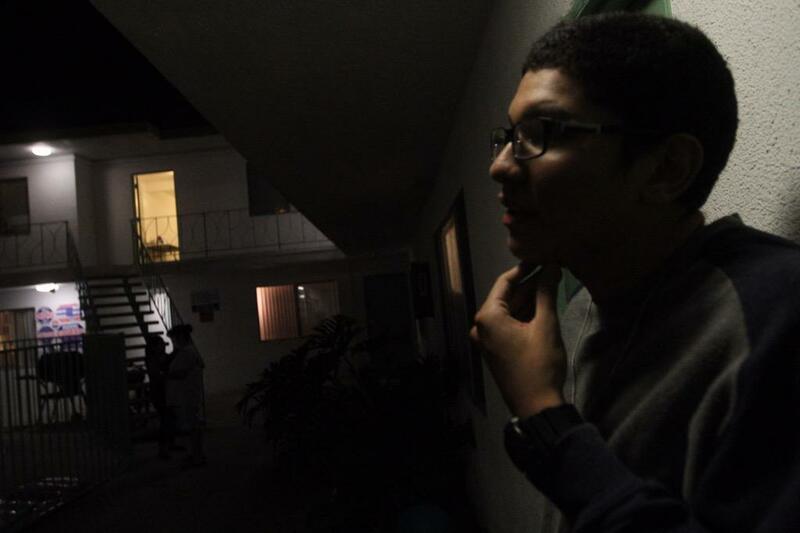 Ian Mercer, father of Chris Harper Mercer, briefly stepped outside his Tarzana home Thursday night and said he had spent the day speaking with police and other authorities. Mercer said he couldn't answer any questions about his son or the shooting. "Shocked is all I can say," he told reporters. "It's been a devastating day." By Thursday afternoon, police had blocked off Chris Harper Mercer's apartment complex in nearby Winchester. Neighbor Bronte Hart told the Associated Press that he would "sit by himself in the dark in the balcony with this little light." She said Mercer's mother could be seen "crying her eyes out" Thursday. Mercer's L.A.-area neighbor Derrick McClendon, 42, similarly described a "bashful" and "timid" man who kept to himself. "I wouldn't have suspected for him to be a troubled person," McClendon said. Local journalists posted these photos from the vigil tonight in Roseburg, Ore.
Chris Harper Mercer and his mother were familiar faces in the tight-knit Torrance apartment complex where they lived for several years before moving to Oregon a year or two ago, a neighbor said. Former neighbors described them as quiet people who kept to themselves and rarely socialized with each other. Mercer was often seen riding a red beach cruiser bike and wearing military-style, green pants with black boots. Several said they sometimes noticed the mother and son carrying black cases that appeared to hold firearms. David Westly, 45, said some neighbors asked him about the weapons at a community BBQ. Westly said Mercer didn't respond to that question but said he enjoyed going target shooting. Westly and others on Arlington Avenue expressed shock that Mercer, 26, has been identified by law enforcement sources as the gunman who went on the rampage. "I wouldn't have suspected for him to be a troubled person," said neighbor Derrick McClendon, 42. "I'm surprised and shocked. I really am." Somehow this has become routine. The reporting is routine. My response here at this podium ends up being routine, the conversation in the aftermath of it.... We have become numb to this. While Thursday's mass shooting at a southwestern Oregon college has sparked a wide-ranging call for stiffer gun safety laws, including an impassioned plea from President Obama, one of the lead investigators into the killings vowed to fight the Obama administration on gun control years ago. Douglas County Sheriff John Hanlin, whose agency was one of the first to respond to the attack at Umpqua Community College on Thursday, was one of nearly 500 sheriffs who took an oath to protect 2nd Amendment rights in the wake of the Newtown, Conn., school massacre in 2012, according to the Constitutional Sheriffs and Peace Officers Assn. , which spearheaded the effort. In a letter Hanlin wrote to Vice President Joe Biden in 2013, the sheriff argued that gun control "is NOT the answer to preventing heinous crimes like school shootings," according to a copy of the letter published by Mother Jones on Thursday. Each sheriff who signed the organization's pledge said he would refuse to enforce any additional gun control measures passed after the shootings at Sandy Hook Elementary School, which left 20 children and six adults dead. Douglas County Sheriff John Hanlin said Thursday night that police have confirmed the identity of the gunman who opened fire at Umpqua Community College in Oregon, but refused to say the man's name aloud. Law enforcement sources previously told the Los Angeles Times that the gunman was 26-year-old Chris Harper Mercer, but a visibly emotional Hanlin said he wouldn't give the gunman the attention he probably craved. "Let me be very clear: I will not name the shooter. I will not give him the credit he probably sought prior to this horrific and cowardly act," Hanlin said. "You will never hear me mention his name." Police have not commented on a motive in the attack, and Hanlin said the identities of the victims may not be released until Friday at the earliest. Officers have completed a sweep of campus buildings and found no explosives or other weapons, according to Hanlin. A search of vehicles in the school's parking lot is continuing, he said. Mercer previously resided in Torrance, according to a law enforcement source. There have been 142 school shootings in the U.S. since 20 children and six adults were killed at Sandy Hook Elementary School in Newtown, Conn., on Dec. 14, 2012. The Oregon school shooter was area resident Chris Harper Mercer, 26, said a law enforcement official speaking on condition of anonymity because the case is new and still under investigation. Mercer formerly lived in the South Bay area of Los Angeles County, and has relatives in the San Fernando Valley, according to another law enforcement source. He added the gunman was armed with three handguns and an assault rifle. The official did not know whether all the guns were fired, or where or how they were obtained. Officials said they did not believe Mercer was connected to the school as a student or staff member at this time. The law enforcement official said Mercer's motive was "not immediately clear." Additionally, people who were on campus at the time of the shooting and have emerged safely are encouraged to register on the Red Cross website. Their loved ones can then check the site and know their status. Douglas County Sheriff John Hanlin said 10 people were killed and seven others injured in the attack at Umpqua Community College. Acknowledging that the numbers provided have varied throughout the day, Hanlin said his figures were the most accurate ones available to him. The state medical examiner's office will be in charge of identifying the dead and notifying their relatives. Hanlin said officials may need up to 48 hours before they make that information public. Of the seven people injured, three were taken to a hospital in Eugene in critical condition, Hanlin said. The other four were taken to a local hospital. The identity of the shooter has yet to be released. Hanlin would not comment on a motive in the attack. Earlier on Thursday, the Oregon attorney general's office told several media outlets that 13 people had been killed in the shooting. A spokeswoman for the office has since told the Los Angeles Times by email that the number was "unconfirmed." Annoyed by the "he said-she said" reporting when it comes to firearms and safety, I decided to determine objectively, through polling, whether there was scientific consensus. What I found won't please the National Rifle Assn. I found widespread confidence that, for example, a gun in the home increases the risk that a woman living in the home will be a victim of homicide (72% agree, 11% disagree) and that a gun in the home makes it a more dangerous place to be (64%) rather than a safer place (5%). There is consensus that guns are not used in self-defense far more often than they are used in crime (73% vs. 8%) and that the change to more permissive gun-carrying laws has not reduced crime rates (62% vs. 9%). There is consensus that strong gun laws reduce homicide (71% vs. 12%). Of course it's possible to find researchers who side with the NRA in believing that guns make our society safer, rather than more dangerous. But they're in the minority. The attack on Umpqua Community College was both a "tragedy and an anomaly," college President Rita Calvin said. "I feel awful. To witness the families that were waiting for the students in the last bus and to see all of the hugs and weeping and trauma that has gone on," Calvin told reporters. "More people were hurt than just the ones that were shot." Calvin said that the school was not aware of any threatening messages the shooter may have left on social media in recent days, and that no threats had been made against the campus recently. The campus employs at least one security officer, and several faculty members are retired law enforcement personnel, according to the college. But none of them are allowed to be armed. Cassandra Welding's writing class was nearly over when she heard a noise that seemed to be coming from next door. A classmate opened the door to look. She was shot. "We were screaming, 'Close the door! Close the door!'" said Welding, 20. Another classmate dragged the woman into the room and locked the door. Someone else turned off the lights. Classmates performed CPR on the woman, who appeared to be shot in the torso. Students crawled along the floor to the back right corner of the classroom, getting as far away from the door as possible. "I was so terrified for my life and I was shaking," she said. Blood covered the walls near the student who'd been shot. The wounded woman's broken glasses lay on the floor. Someone called 911. Welding called her mother. "Hey, Mom, there's a shooting at school," she whispered, afraid the shooter could come in at any minute. "I just heard other people in tears, crying, calling their loved ones and telling them, 'I love you.'" "It was such a heart-wrenching thing." Today's shooting at Umpqua Community College felt sickeningly familiar to many local residents: Less than 10 years ago, a student opened fire at nearby Roseburg High School. In that 2006 shooting, a high school freshman shot a fellow student four times in the back with a semiautomatic pistol containing hollow-point bullets, according to OregonLive . The victim survived, and the incident led schools and other institutions in the area to develop plans on how to handle and try to prevent such shootings, OregonLive reported. 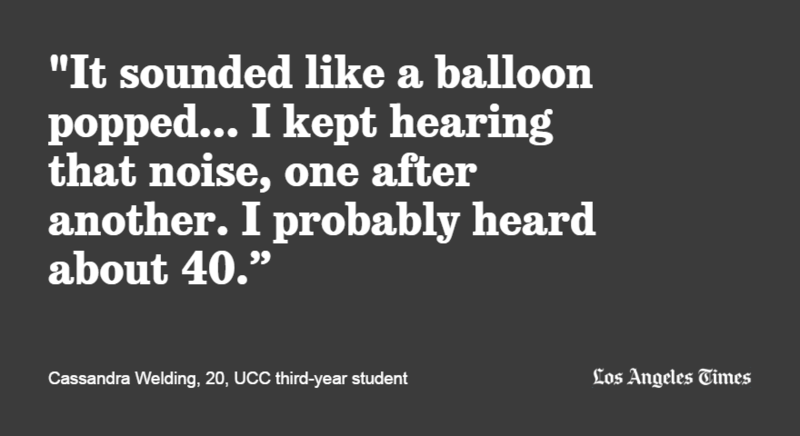 In the first frantic series of police recordings about the shooting at Umpqua Community College, officers said the suspect was possibly armed with a "long gun" when he opened fire into a crowded section of Snyder Hall. On the recordings, a dispatcher can be heard saying the gunman was "outside one of the doors shooting through the doors" of Snyder Hall. There were at least 35 people inside the building at the time, police said on the recordings. Several minutes into the recording, an officer on scene can be heard describing an exchange of gunfire with the assailant before shouting, "The suspect is down!" After the gunfire ends, another officer can be heard calling for immediate medical aid. "They need to dispatch as many ambulances as possible to this incident," the officer says. "We have upwards of 20 victims." This unspeakable tragedy that occurred at 10:30 this morning, sadly, puts Oregon on the growing list of horrendous mass shootings in our country. #UCCshooting: Two victims arrived (REACH helicopter landing pictured here), three on the way. Blood supply good for now but may be stretched thin. Call Lane Blood Center 541-484-9111 to donate. The gunman who opened fire at Umpqua Community College in Roseburg, Ore, was killed in an exchange of gunfire with police, Douglas County Sheriff Jon Hanlin told reporters. Hanlin said sheriff's deputies responded to reports of an active shooter at 10:38 a.m. The deputies found the gunman, who was not identified, inside of a campus building and a shootout began, according to Hanlin. At that point, the man was shot and killed, Hanlin said. The sheriff confirmed that there were "confirmed injuries and confirmed fatalities," but he declined to give a specific number, as other officials have. "I've heard varying numbers, and I don't want to report on a number that is inaccurate," Hanlin said. Hanlin declined to describe the shooter or comment on what type of weapon he may have used. Oregon Gov. Kate Brown, speaking in a separate briefing, said the shooter was 20 years old. Jodi Sonka, who said she is a student at the college, said a professor thought at first that the campus was going through an active shooter drill. "He was like, 'Oh, this never happens,'" Sonka told CNN. "Then he heard it was real and said we all need to get in the back room now, immediately." After the shooter was in custody, Sonka said, FBI agents entered the classroom and told them the shooter was down. "We were all taken outside to be patted down by police officers to make sure no one else had anything on them," she said. "We were loaded on buses and taken to the fairgrounds." Sonka said students are also being told that they won't be allowed to retrieve their cars on campus until they are searched and cleared. When a shooter opened fire this morning at Umpqua Community College in southwestern Oregon, Douglas County Commissioner Tim Freeman's 19-year-old son was on campus. Freeman said his son was prepared with an emergency plan -- and lucky: "He immediately left campus, went to a friend's house, to a safe location, and called me." "We're now in that horrible club of schools that have had to deal with this," Freeman said. "I hope communities around our nation will pray for us." Freeman said he is assisting with the incident command center that has been set up on campus, helping deploy mental health, counseling and other resources for students and faculty members who have been evacuated to various sites in the county. As of 1 p.m. PDT, Freeman said, a handful of students were still being loaded into buses to be evacuated from campus. "The lines are almost done," he said. "Virtually all faculty are gone now." Law enforcement officials were continuing to sweep buildings on campus, he said. Today's shooting at Umpqua Community College in Oregon follows at least two other major school shootings in the state. A 14-year-old Oregon high school student was killed and a teacher wounded when a gunman opened fire before class at Reynolds High School in Troutdale, about 16 miles east of Portland, in 2014. Four people died and more than 20 others were injured in a shooting at Thurston High School in Springfield in 1998. Kipland P. Kinkel, 15, a freshman, killed his parents at home before killing two students at school. Five classmates brought Kinkel to the ground before he was arrested. Kinkel had been suspended a day earlier for bringing a gun to school. The White House said President Obama has been briefed by his homeland security advisor on the mass shooting at Umpqua Community College in Roseburg, Ore., according to the Associated Press. At the president's request, he'll continue to receive updates throughout the day. Oregon's attorney general says 13 people have died in the shooting, according to the Associated Press. 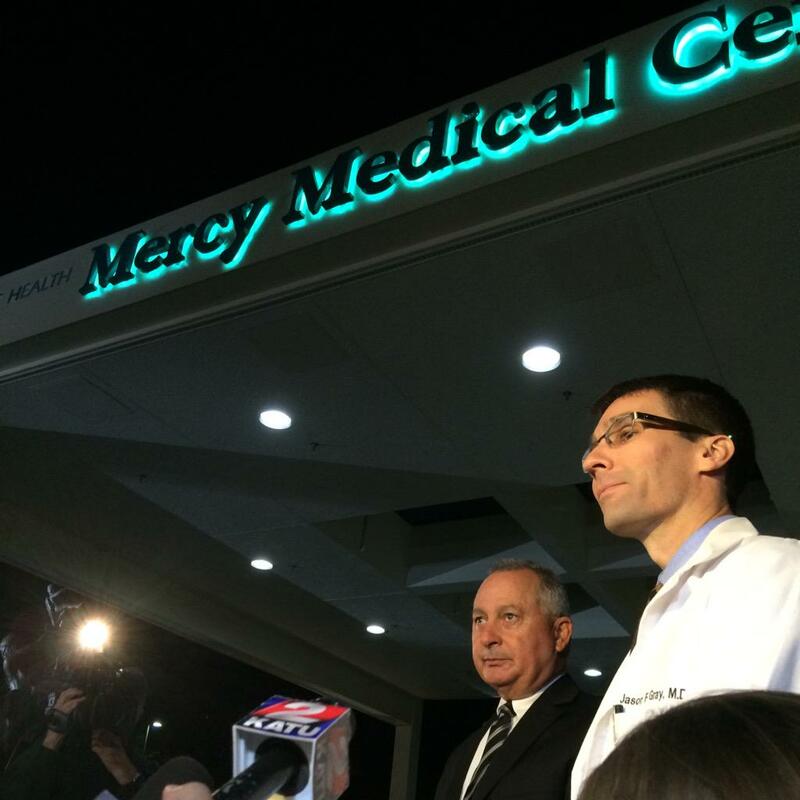 The three main hospitals taking patients in connection with the Umpqua Community College shooting in Oregon are PeaceHealth Sacred Heart Medical Center in Springfield, Mercy Medical Center in Roseburg and Providence Portland Medical Center in Portland, according to Anne Williams, a spokeswoman for PeaceHealth Sacred Heart. Williams said the call to receive patients came in almost immediately after news of the incident broke. "We are feeling very well prepared," Williams said. "We called in additional staff. We have trauma surgeons ready. We cleared out the emergency department to accept the patients." Oregon Gov. Kate Brown and state police are scheduled to speak to reporters about the Umpqua Community College shooting at 1:30 p.m. PDT in Portland. "My heart is heavy as details of today's shooting become available," Brown said in a statement. "While it is still too early to know all of the facts, the effects of an incident such as this one are long-lasting. Please join me in keeping the victims and their families, as well as first responders, in your thoughts." Umpqua Community College had been in the news earlier this week for a federal report critiquing schools with some of the highest rates of loan defaults. Umpqua caters to students who generally can't attend more elite four-year universities. Umpqua Community College -- near Roseburg, Ore., about an hour's drive south of Eugene -- began its fall term this week. The two-year college says it had about 13,600 students in 2013-14, the most recent academic year for which figures are available. Of those students, about 3,000 were taking courses for credit. Its student body is about 58% female and 42% male. The students' average age is 38. The school says its tuition is the lowest in Oregon's two-year college system. For the record, 1:04 p.m.: An earlier version of this post referred to Eugene as the capital of Oregon. Oregon's capital is Salem. Op-ed: Can we pick out mass shooters before they kill? There is a moment following every mass killing when the media turn their attention to the shooter's mental health. Pundits wonder: Could the tragedy have been averted if only the killer had received better psychiatric care? A history of mass shootings in the U.S.
Today's tragedy joins a long list of mass shootings in the nation. Here's a look back at several other notable ones, from an attack at a McDonald's in San Ysidro, Calif., in 1984, to this year's rampage at a historic black church in Charleston, S.C.
Oregon State Police Lt. Bill Fugate told told KATU-TV that at least 7 people were killed and 20 others injured. The Bureau of Alcohol, Tobacco, Firearms and Explosives says it has sent agents to the campus, and more are coming soon. Multiple people were killed and at least 20 injured in a shooting at a community college in southwestern Oregon this morning, and the shooter is in custody, officials said. "We do have multiple deceased" on the campus of Umpqua Community College, but the number is unclear, Douglas County Fire Marshal Ray Shoufler told CNN. Eleven shooting victims were taken to hospitals, and two of those have died, he said. It took law enforcement officers some time to evacuate each classroom and secure the campus because it's so spread out, Shoufler said.